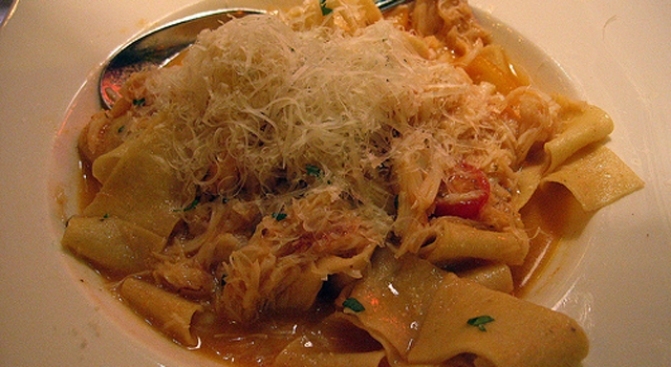 Fresh fettuccine with Dungeness crab. I don’t go to North Beach often, not because I don’t like it, but because it’s usually flanked by tons of tourists (the only neighborhood that’s worse is Fisherman’s Wharf). My friend Dominic and I found ourselves there a few months ago to see Dave Chappelle at Cobb’s Comedy Club and afterwards, I was famished. We settled on dinner at Calzone’s, a bustling restaurant on Columbus Avenue in the heart of North Beach. I had the fresh fettuccinne with Dungeness crab, a dish I’d first tried here a few years back. Sadly, the crab was less flavorful than I remembered it and the sauce was sort of bland too. Its saving grace was the fresh pasta itself, which was more of a pappardelle. It was tender but not mushy, with a silky texture. I’m yet to find a really outstanding restaurant in North Beach, so if you know of one, drop me a line. I want to love North Beach, I really do.